Business phone systems for hospitality services. The hospitality industry relies on phone calls throughout almost every aspect of their business. Whether its speaking with customers about reservations or staff communications in operations, office phone calls are critical to ironing out details and making a profit. Having a reliable, affordable business phone service that also allows supports mobile phones is a must. What are hospitality businesses looking for in an office phone system? Hospitality companies are often managing a high volume of calls that handle a variety of business needs, from scheduling reservations to coordinating staff and third-party businesses that work with you on events. Communication is the glue that holds hospitality services together, which means you need a business phone service that can keep up with the pace. Features included in the Ooma system can help you manage all of your contacts and ensure that no call goes unanswered. The virtual receptionist feature, for example, can be set up to help hotel, motel and bed and breakfast (B&B) owners to greet customers, provide basic information about services, pricing and location, and direct callers to the right extension to get more information if they need it. Mobile access is also a critical part of the hospitality industry. Most of the time, you will be out of the office at scouting event spaces, working with caterers and restaurants, talking to suppliers and meeting with clients for walk-throughs. Having smartphone access to your main business line is an absolute must. Learn about how this apparel manufacturer became more productive and reduced phone bills by $1,000 a year. Find out how this architectural firm was able to handle business communications on-the-go with the flexibility to grow. When we got the unit it was very simple to set up. In fact, within an hour of opening the box we were all using Ooma. The key benefits we quickly realized were time savings which have translated into cost savings. There are several Ooma Office features that can help busy hospitality professionals manage incoming calls and create a more flexible and scalable communications plan. Virtual receptionist: On any given day, you might be talking to caterers, valet drivers, entertainers, and others to ensure your events run smoothly and go according to plan. Having a virtual receptionist directing business calls to the right individuals is the best way to stay organized and keep your business looking polished and professional. All-inclusive pricing: Enterprise-level phone features are typically only available to small businesses as an add-on to already high-cost phone plans. 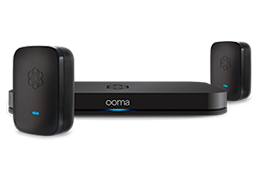 With Ooma, it’s possible to get all of the great features you love at a price you can afford. In fact, for a monthly cost of just $19.95 per user, you can save an average of $6,185.44 after three years of service. Mobile access: People who work in the hospitality industry are rarely at their desks – in fact, most of the time they are out in the field either planning for or working at events. The Ooma Office mobile app allows you to get all of the business phone features you love from your smartphone while still being connected to your main office line. To see how your hospitality business can manage business calls more effectively and affordably, check out the office phone systems page to learn more about our features, benefits and pricing.